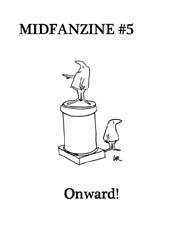 MidFanzine is published by Midfan - a group of Midwest convention running fans who've decided to band together to help make conventions run better, and to further fannish connection in the Midwest. More details are on the About Us page at the MidFan website. The issues below are from the archive, dated 2002-2004, but a new issue 4 is out as of October 2009, and issue 5 in November 2010.